Here's a masterpiece kids will love. I've never thought of a graphic novel (high-end comic book) as a masterpiece before, but I think the moniker fits Tiny Tyrant. The hero is a six-year-old king; a kind of likeable spoiled brat. King Ethelbert rules Portocristo - and we have no idea why, or where his parents are, but we don't care. He has an equally diminuitive and bratty cousin Sigismund, with whom he feuds, and there are some adult handlers who keep the mayhem from getting too out of control. Even better than the plots - which are silly enough for any kid - are the gorgeous illustrations. They're simple and clean, in the best French tradition (think Asterix), and rendered in beautiful, rich colours. 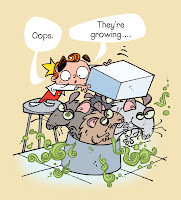 Good readers will devour the book fairly quickly, but younger readers may be able to get a few more hours out of it. Either way, it's time well spent. The books never condescend to young readers, which is part of their charm. There are two volumes, but beware that Volume 1 has a chapter featuring Santa Claus, that may shine too fine a light on the legend for young readers. 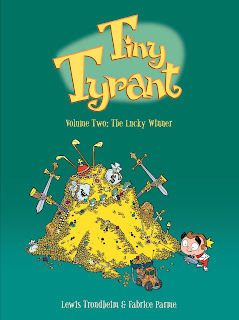 Ever since First Second Books sent me Tiny Tyrant Volume Two: The Lucky Winner (I subsequently asked to see Volume I as well), I've been a bit obsessed with the books. The covers are beautiful - that soft, deeply saturated paper. And each chapter is printed on a different coloured pastel background. I can't put them down, and neither could my son.